Supporting homeless people through art and photography, Cafe Art has helped even more people this year with the calendar project. Over 100 disposable cameras were given to homeless people with the brief to take photos of their London over a period of five days. A panel of judges from across the arts world then selected their top twenty from which thirteen images will be selected to create the cafe art calendar for 2017. You can partake in this selection by voting for your favourite. 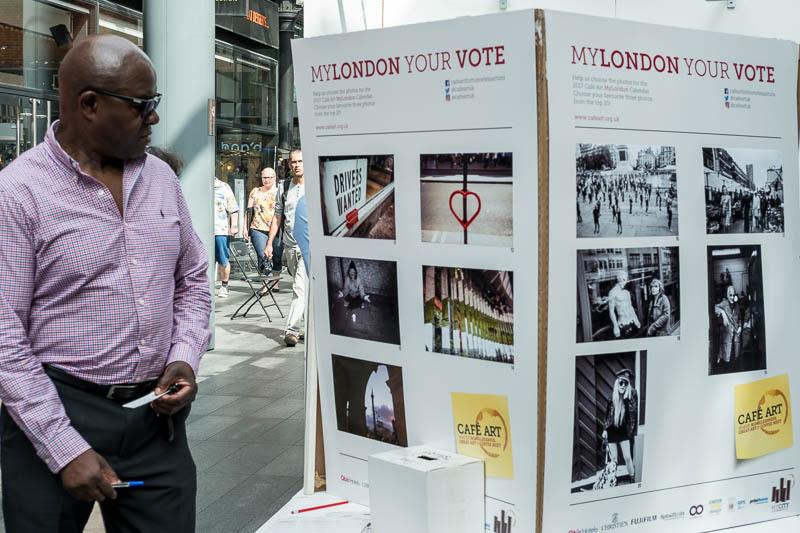 The images and voting booth are currently on display at Spitalfields Market. Not only are the overall top twenty on display but every photographer has their own personal top five on show. You can see what a tough time the judges had selecting from so many talented photographers. The calendar will be on sale shortly. I'll keep you posted to let you know where you can buy your copy. All the proceeds from the sale of the calendar go into creating the following years calendar, 100 were helped this year, how many can you help next year? Excellent way to show your support! It sounds like a very good idea. I like the project, and I hope to buy one of the calendars.